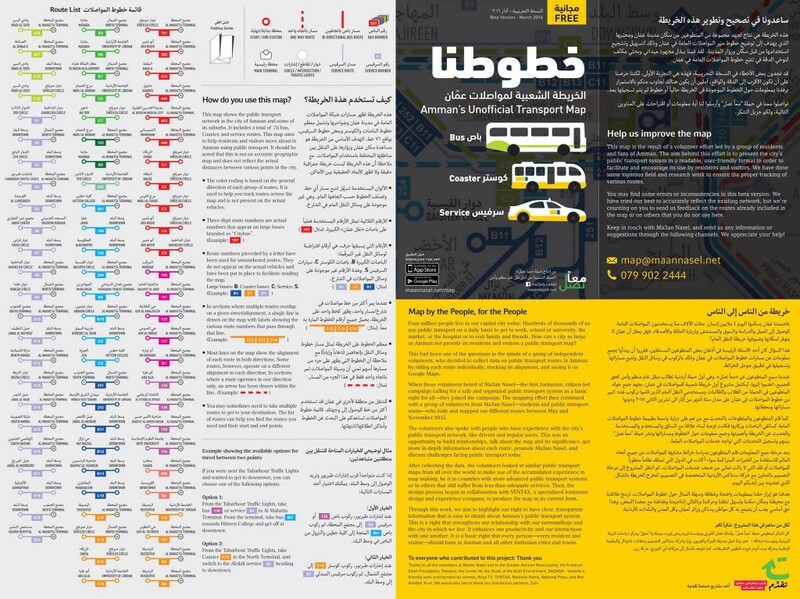 For the past seven months, SYNTAX has been working on a project which I consider to be one of the most meaningful our company has handled in recent years: designing Amman’s first public transport map. As I write this, this map is being printed in a limited test quantity, to be distributed to Ammanis who are riding busses, “coasters” and service-taxis to get to their places of work, study, shopping, healthcare, leisure, or simply going home or to visit family or friends. In a few weeks, the map will be printed in massive quantities for wider distribution. It will be available online and as as mobile apps for iOS and Android. Yes. 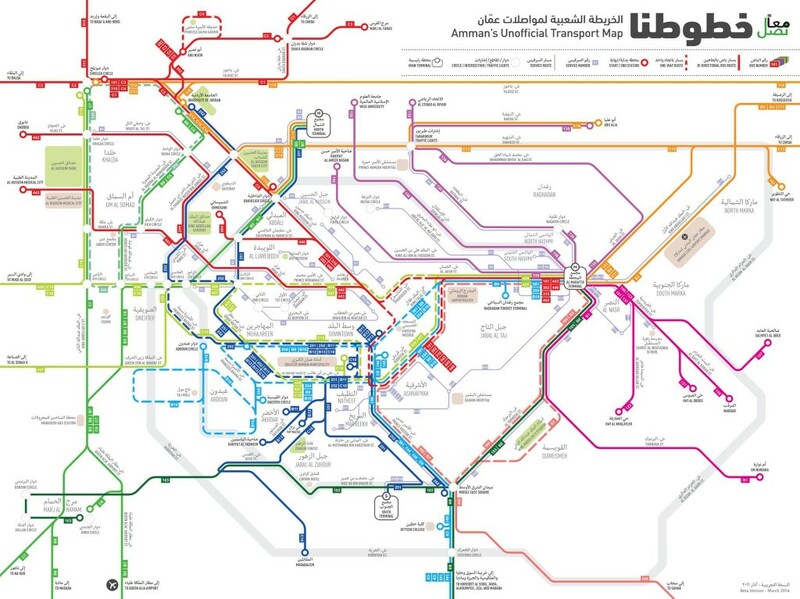 It’s time the residents and visitors of Amman, our capital, got a map that, for the first time ever makes the public transport system in our city (as broken as it is) visible. This has the potential to transform the experience of public transport in Amman in more than one way. It may end up making a small difference in the lives of millions. That’s why I think this project is so important. I get quite emotional when I talk about this endeavor. Angry, sad, anxious, yet also excited, proud and energized. I am dismayed that our city authorities have not been able to produce a map for us in the past decades. I get angry when I see Amman’s streets clogged with ever worsening traffic jams. I am sad to see the indignity of those who do not own cars, struggling to use a weak transportation system. We all deserve better. I am baffled at our governments who, over the past decades, have spent hundreds of millions of Dinars on roads, bridges and tunnels in Amman but ignored to develop a modern public transport system. Amman has become a congested, polluted, nerve-wracking city because of short-sighted policies driven by car-driving politicians and bureaucrats. Yet I am also exhilarated to have been part of a project that fulfilled a lifelong dream of mine: producing a transport map for Amman. I blogged and talked about such a project in the past, but it took much more than that to make this a reality. And the reality is that it took a real initiator: Peter Damrosch, an American teacher who lived in Jordan for a while and who had the spark that started the fire: he got on busses and started tracking their routes on Google Maps, marking the beginning of an amazing journey. Then it took an organization, Maan Nasel (Arriving Together): Jordan’s first grassroots campaign demanding a modern public transport system for all, who embraced Peter and his early collaborators, recruited more volunteers to finish mapping most of the city’s transport lines. Then it took a brilliant designer, Ahmad Sabbagh, my collaborator at SYNTAX for over a decade, who somehow was able to learn the art of transport mapping in no time and craft an intricate work of highly functional design, that translates all the work done by the volunteers into something people can actually use in their daily lives. I also feel humbled, because we, as SYNTAX designers, stood on the shoulders of giants: pioneers of transport mapping like Henry Charles Beck, the draughtsman who drew the London Tube Map in his spare time in 1931, inspired by the geometry of electrical circuits to create a geometrical transport map that prioritized connections over geography. But we also became aware of an entire global movement of volunteer-based map design projects in the developing world. Amman didn’t only learn from London, Berlin and New York, but also Dakha, Bangladesh and Nairobi, Kenya as well as many other cities around the globe, who’s mapping experiences where documented online for everyone to learn from. 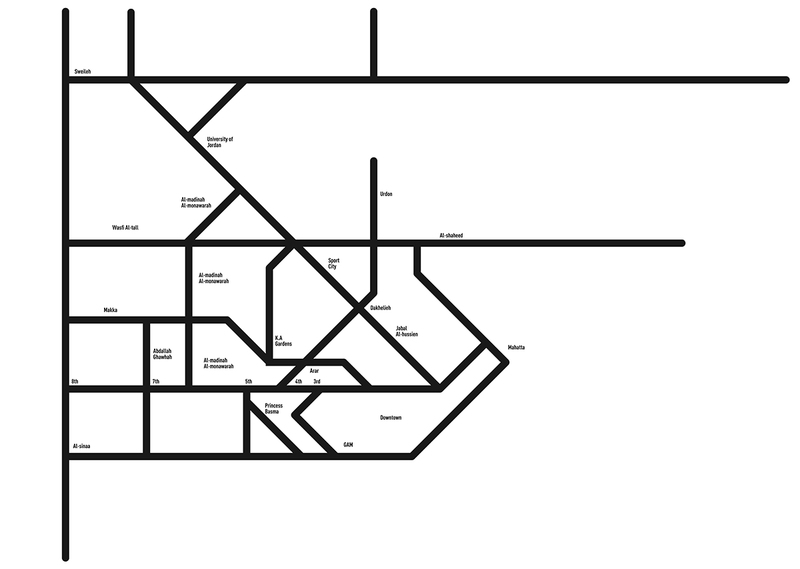 The first design challenge SYNTAX had to deal with to produce a transport map for Amman was to come up with the underlying grid upon which all the map’s elements would be layered. We considered Amman’s major highways, streets, intersections and its famous traffic “circles” (roundabouts) and abstracted them using a strict geometrical system to produce our first grid. 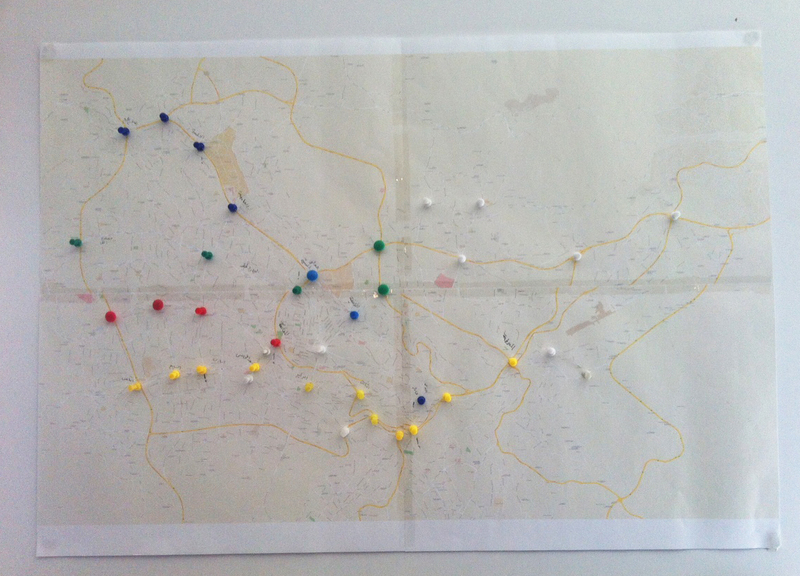 We then added the city’s neighborhoods (many based on Amman’s well known hills), public parks and well known landmarks. Our aim was to enable people to relate the map to the common mental model they have of the city. Downtown Amman, where a lot of transport lines converge, had to be enlarged in proportion to the the city’s other neighborhoods. 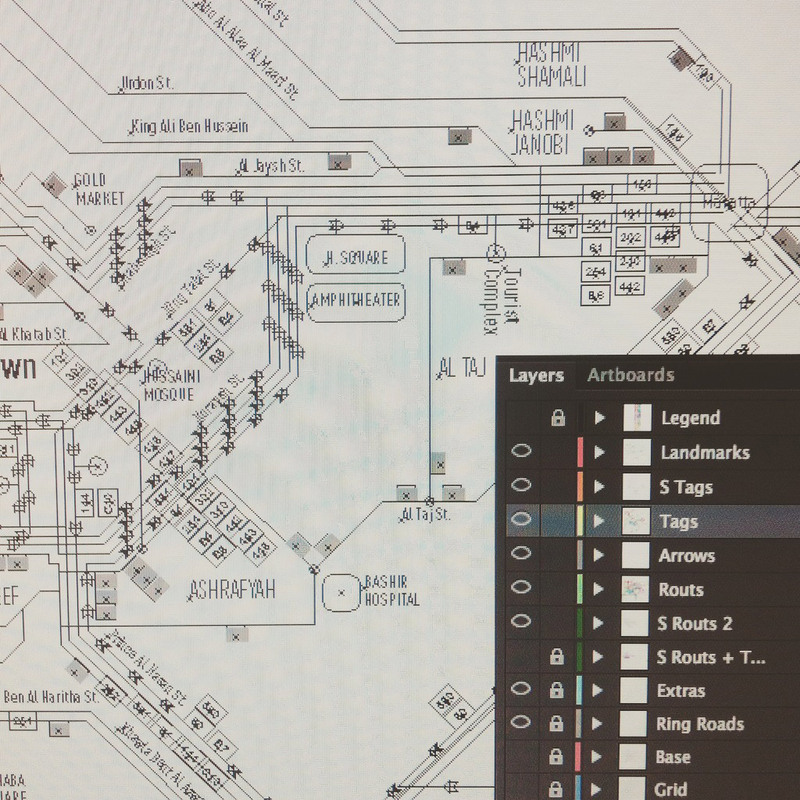 This way, the intricate network of lines in the downtown area was made clearly readable. Amman’s two “ring roads” where indicated to on the map to define the boundaries of the city’s inner core and its outer belt of suburbs. 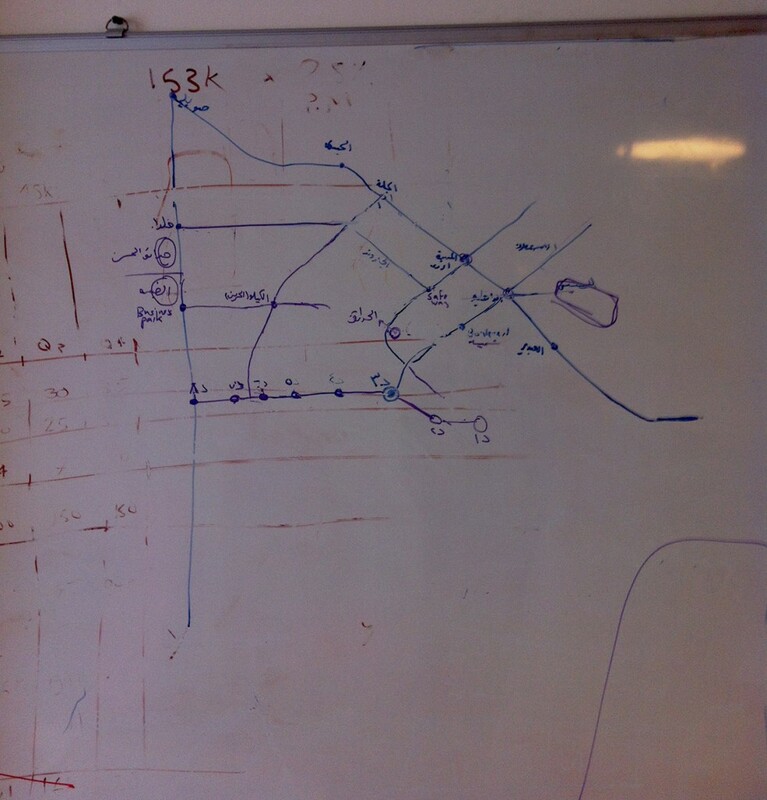 Only then could we add the 76 documented transport lines on the map. A color coding system was devised that classifies the lines into their general directions and make it easy for the user to follow the path of any given transport line. In designing all the intricate details, symbols and visual elements of this map we drew on the collective experiences of the volunteering team behind this project which included transport experts, urbanists and activists. We also learned from the wealth of case studies we found online. The design went through no less than a dozen iterations until we were satisfied with it. 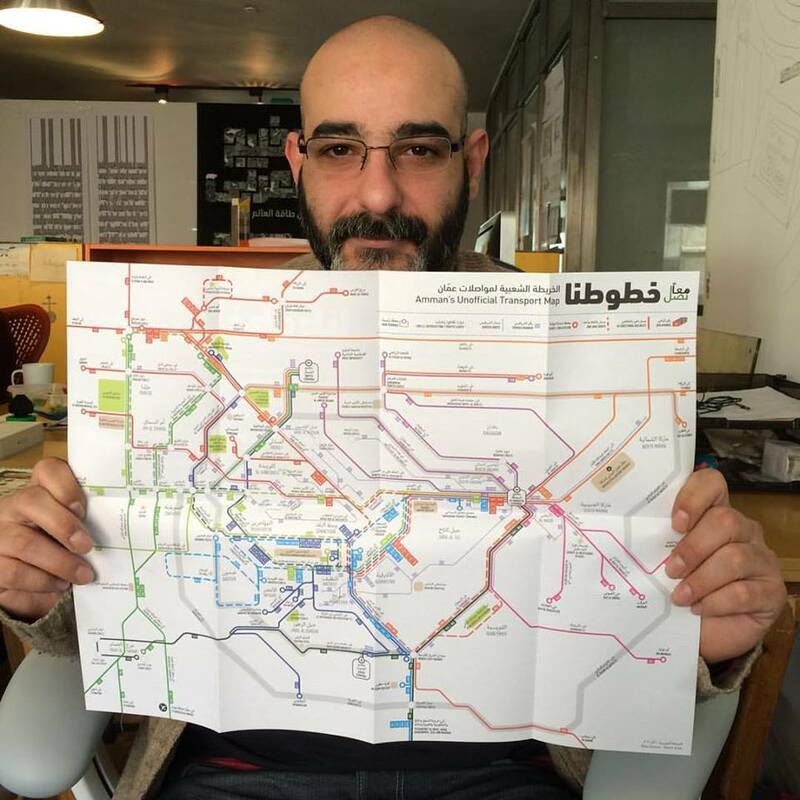 Now, I am excited as the first version of the Unofficial Amman Transport Map will hit the streets and phone screens around the city. My enthusiasm for this project doesn’t just come from the collaborative process of its creation, and its potential to improve, if just a little bit, the experience of getting around in Amman. There is more. 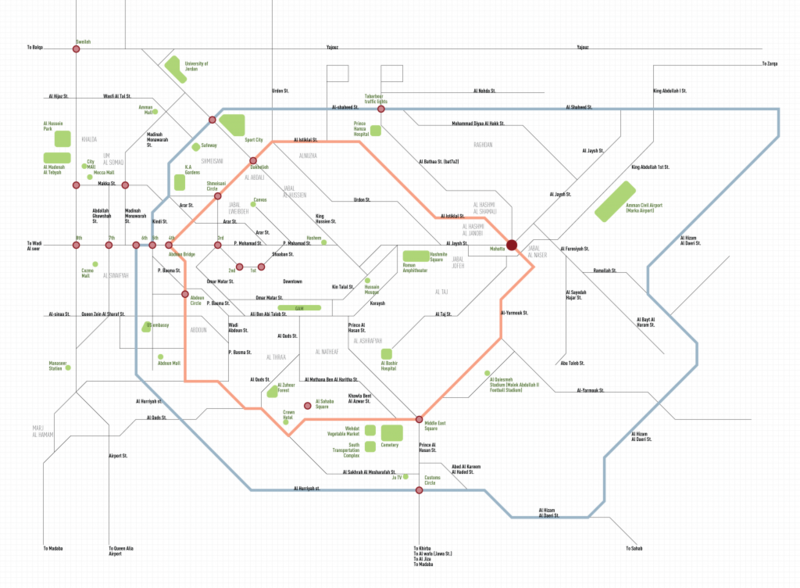 For the first time we have a visual tool that enables us to see Amman’s transport system in its entirety. It unites us as Ammanis around one map that we can talk about and use as a tool to address the various authorities that oversee the system and are responsible for its future development. Make no mistake: Amman’s transport system is badly broken. We have too few busses. Those we have are barely up to acceptable standards. We have no regular bus schedules. The bus stops on the street are there for decorative purposes. We don’t have a fair bus fare system, nor an easy way to pay. But at least we now have a map that we can point at and talk about. A glimmer of hope might be the Bus Rapid Transit project, which has been delayed for too long. But what we need are immediate, tangible improvements in the existing system. And that’s were our unofficial map will help. At SYNTAX we claim to design “transforming experiences”. We use the tools of research, observations, design thinking, branding, communication and technology to create experiences that inform, delight, teach and hopefully improve life. I get nervous when I start anticipating the result of the countless hours of work put into this project, be it the work of volunteers, activists and us as designers. Will anyone care? Will people find it useful? Will it drive the conversation about the public transport in Amman forward? Will it make a contribution towards a more fair, friendly, usable, productive and enjoyable Amman? That remains to be seen. This doesn’t stop here. The work of Maan Nasel is not done. It’s barely beginning. But the first step is to do something. Create a map. Get it released. Then see what happens.